Got your pail and shovel? Let's go! Boy's or girl's pull-on pants have front patch pockets, button-through back patch pockets, elasticized back waistband, and drawstring at front waistband. Stencil includes starfish pattern and instructions for painting with freezer-paper. Share your photos on Instagram with the hashtags #sandboxpants and #oliverands. Boy's or girl's pants and T-shirt stencil. Pull-on pants have front patch pockets, button-through back patch pockets, elasticized back waistband, and drawstring at front waistband. 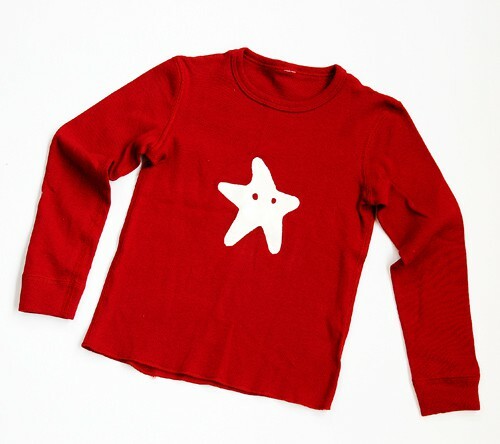 Stencil includes starfish pattern and instructions for painting with freezer-paper. After successfully sewing this pattern, you will have developed the following skills: buttonholes and patch pockets. Pants: Light- to medium-weight woven fabrics like quilting cottons, broadcloth, canvas, corduroy, denim, poplin, and seersucker. Waistband and Drawstring: Lightweight fabrics like quilting cottons, broadcloth, or poplin. Pants: Thread, two 1/2" buttons, 1/2 yard of 3/8"-wide elastic. Template: Freezer paper, fabric paint in one or more colors, paintbrush. Pants Length 13 3/4" 14 1/2" 16 1/4" 18" 20 1/2"
Hip 22" 23" 24" 24 1/2" 25 1/2"
Leg Opening 12 1/4" 12 3/4" 13 1/4" 13 1/2" 14"
Pants Length 23 1/2" 26 1/2" 29 1/2" 32 1/2" 35 1/2"
Hip 26 1/2" 27 1/2" 28 1/2" 29 1/2" 30 1/2"
Leg Opening 14 1/2" 15" 15 1/2" 16" 16 1/2"
I love this pattern and in fact purchased it in another size range for my younger child. 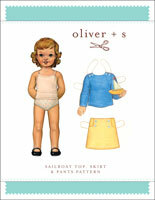 It was my first oliver + s pattern and I was not disappointed! In fact, it made me love sewing with patterns again: from the simple and pleasing aesthetics of the instructions and pattern itself to the ease with which everything came together to the lovely finished result, it was truly a joy to sew. These pants are perfect if you're looking for a relaxed fit, casual woven pant (hard to find a good one; my search for said is what introduced me to oliver +s in the first place) and definitely for both genders, depending on the fabric and embellishment choices you make. I anticipate making these many, many more times - in fact I'm working on two more pairs at the moment. Don't be afraid of digital downloads with this designer, either - the printed pages are a breeze to put together. A note on length: the unhemmed pants did end up quite a bit longer than I anticipated, given the measurements, but honestly this is not a problem in my book and I would always prefer to have more length to work with rather than less. I did a wide hem (for letting down later) on my first pair, and will probably end up trimming a bit of excess off subsequent pairs, but again, I'm fine with that and wouldn't change a thing about this pattern. Thank you so much! Very easy to follow pattern. Great results, even without a great deal of sewing experience. I've made three pairs of these for my 18-month-old son so far: one in seersucker, one in a lightweight denim shirting, and one in a linen blend. I made the 6-12 month size, but lengthened the legs by about 1.5 inches. They fit beautifully--covering the diaper without riding up. I will definitely be making more for fall and winter in corduroy. 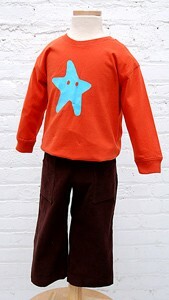 love this pattern have been using it for years for my boys, its playful, and has a fit that makes it just right! Worn so often they wore out! One of the few pieces of clothing I couldn't hand down. They fell apart from use! I made these for my Twins in soft pinwale cord. They had an excellent long leg and a good high waist. 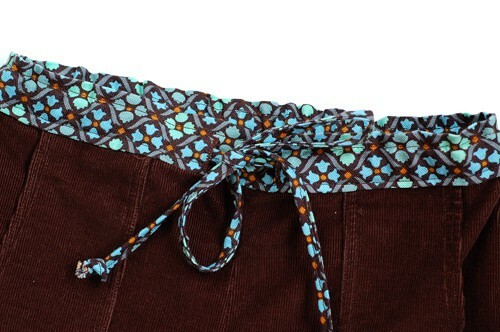 The draw string nicely disguised the elastic waist and is a great design feature. I just wanted to share a tip on threading the elastic http://www.flickr.com/photos/motherof5/5104359946/in/set-72157625588979808 A great unisex pattern. I have made these pants in the 6-12 mo. size for my baby boy. They fit well and just look very cute. Like all O&S patterns, the construction is clearly explained in detail and gives a very professional finish. A friend pulled out the back waistband while my baby was wearing them to try to find a size tag and was surprised to learn that I had made them! One small thing to note, the pattern only is for the pants and stencil, the shirt is not included. Please note that all errata have been corrected in the digital version of this pattern. These notes apply only to the first printing of the paper pattern. Piece #3, waistband: cut 1, not 2. On the large sizes (4-8) please note that in the first printing the size labels on pocket pieces #5 and #6 got transposed at the bottom edge of the pockets. They should be arranged as shown below. 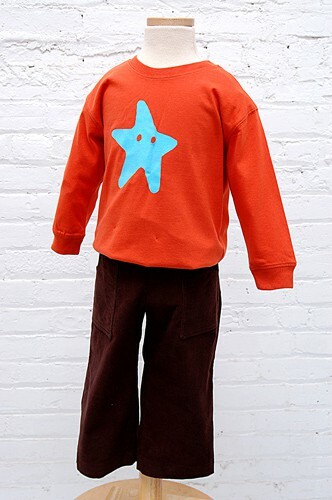 Discussion on the digital sandbox pants + starfish stencil sewing pattern from the Oliver + S Discussion Forums. Find and share more photos on Instagram using the hashtags #sandboxpants and #oliverands.